← Ein Schal kommt selten allein : It’s a shawl! Do you block your socks ? I do – on my feet, when wearing them. I’d be afraid that if I block them they might get too big and loose. 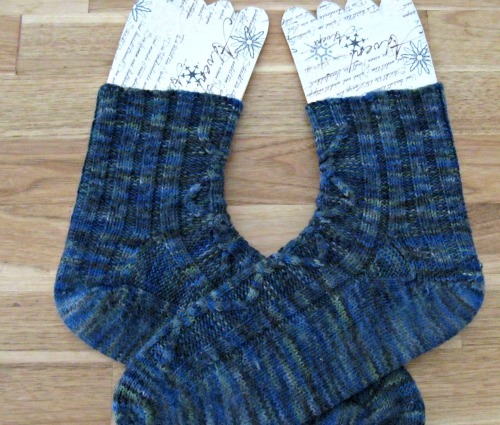 After all, I knit them with a little bit of negative ease to prevent exactly that. So why did I make sock blockers, then? To take pictures. Sometimes it’s just easier to photograph them on the blockers than to contort myself to get a good shot of them on my feet. And here’s a great tip on the Tricksy Knitter for a prop to help with taking photos of hats. Seems like we’ve got the head to toe thing covered.